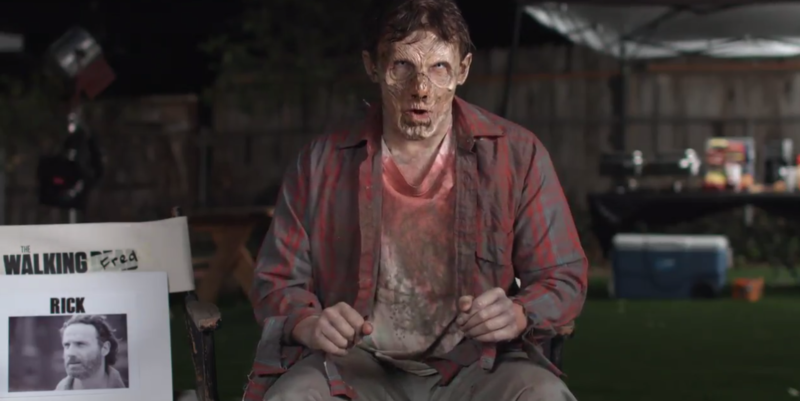 Yesterday, Funny or Die debuted a new series, “The Walking Fred.” It’s a recap of “The Walking Dead,” hosted by the show’s self-proclaimed star — a zombie extra named Fred. Fred films his commentary from the set of the show, in full costume. He gets especially enthusiastic during zombie (“walker heavy”) scenes, pointing out specific extras and “firsts” for the show’s zombies — in one scene he’s excited to point out this is the first time the show has put zombies in sleeping bags. As for the plot-driven parts of the show, his refrains are “boring,” “human stuff,” “talking,” etc. You can find Fred on twitter at @FredTheWalker.